Blog » Monster Helps Kids Take On Politics with Twitter! Monster Helps Kids Take On Politics with Twitter! Thanks to Monster's campaign for literacy and civic engagement, classrooms across the country are tweeting about justice, social issues, and things they want the president to know. 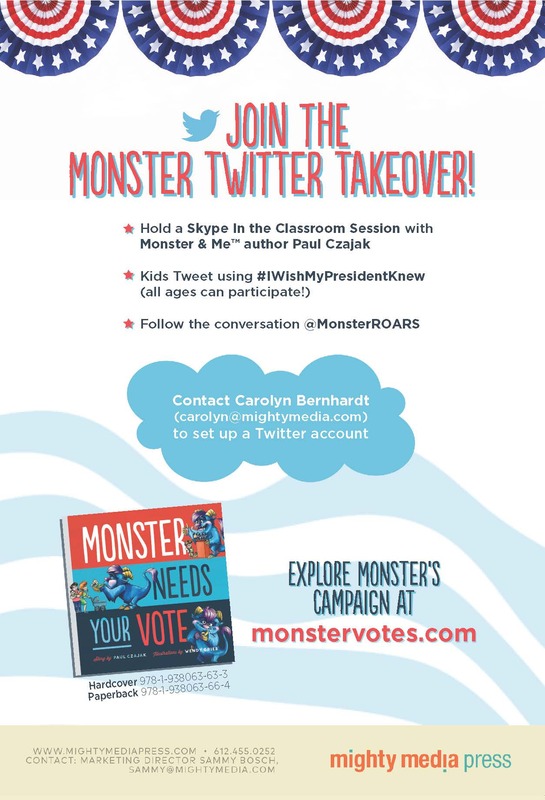 Using the hashtag #IWishMyPresidentKnew, students are expressing their opinions and Monster – along with award-winning Monster & Me™ series author Paul Czajak – is there to help along the way! #Iwishmypresidentknew we worry about car pollution,We also worry about other kids who are hungry and about welfare fraud. Big thoughts! Kids read a book about sparking a grassroots movement, and are inspired to do the same. Kids learn about current issues and why they matter. Kids see how social media affects change and gain digital/technological skills to last a lifetime. Kids develop opinions about the world around them and learn how to take part in action. Kids speak out about their opinions, which they are rarely given the opportunity to do. Kids take a stand to fight for what they believe in. Kids observe the importance of literacy in the classroom, as well as in social and political spheres.